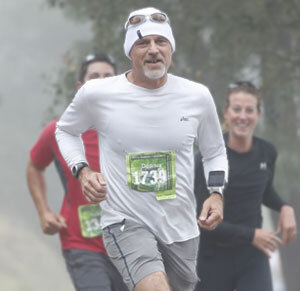 I signed up for this year’s Santa Barbara Wine Country Half Marathon months in advance. The year before my wife Liz and I had ran it for the first time. We were seriously considering moving to Santa Barbara and decided to work in a fun weekend around our Santa Barbara exploration. I had trained pretty seriously last year, and as a result posted a PR of 1:46. I was satisfied, but had really wanted to beat 1:45. This year’s race would be special. We had moved to Santa Barbara and I had joined Fitdigits as it’s president. In addition, Liz asked for her Mother’s day gift that all the kids sign-up and run with us. This year’s half was held on Saturday, May 12, a day before Mother’s day. Sven, my son-in-law who works at Google, would run with Sheena, my eldest daughter, along with their one year old daughter Serevina in a baby jogger. Sven and Sheena are training for an Ironman coming up this fall. Amber my younger daughter, would fly in from NYC to run with us as well. Amber is also an athlete (ex-competitive college swimmer). The stakes were pretty high for the ‘old man’ to perform. With all the best intentions, life’s twists and turns got the best of me. As race day approached, a review of my travel, illness and the delight of running Fitdigits, my training regimen had suffered. I knew that I was in trouble. Either my ego would be shattered or I’d end up hurting myself or both. If you build the length and intensity of your workouts over time, you can retake your assessment and see your progression towards better fitness. Measured progress feels good. It is very satisfying. Also, if you are using sensors and/or a heart rate monitor, the measurements taken during the test are used to individualize and calibrate your fitdigits app. Once calibrated, your heart rate zones and pace zones are set based on you and your current fitness level, not upon a standard chart. Caloric burn calculations will now be more accurate, and this lets you focus on training routines that are targeted to burning more body fat, building endurance, or increasing speed. 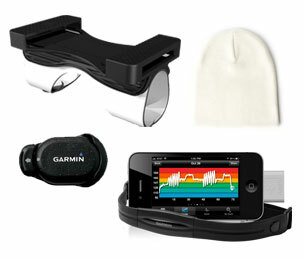 My running gear: wrist band, beanie, foot pod, iPhone, Garmin ANT+ Adapter and heart rate monitor. Instead of letting my ego get the best of me I decided to play it safe and sane. I wanted to run the half marathon at a fast pace — that wouldn’t cause an injury, I could enjoy the run, and then the post race food, wine and music. I chose the CP30 Running test. The test has you run as fast as you can for 30 minutes. It then calculates heart rate zones for you based upon your lactate threshold. Lactate threshold or lactate inflection point is when your body starts producing more lactic acid than the blood can remove from your muscles. This accelerates fatigue. For long distance running, you want to stay below your lactate threshold, otherwise you become exhausted, loose your form, and if you keep pushing you are likely to hurt yourself. I ran the test and the fitdigits app recalculated my heart rate zones and indicated that my lactate threshold pulse was 159 beats per minute. My strategy was set. I’d track my heart rate throughout the race, keeping it a few beats below 159. Now I wasn’t trying to keep up with Sven, my goal was to have a fast but fun race, and then a post race celebration! I averaged 12 miles per week. Screen shot taken from My.Fitdigits.com. This entry was posted in Testimonials, Training and tagged avoid fatigue, avoid injury, CP30, customized heart zone, fitness assessment, fitness level, half marathon, lactate threshold, marathon training, pace, pace zones, running assessment by Christopher Means. Bookmark the permalink. Very informative article about using a heart monitor when training for a race. Who makes the wrist case Dean used?